Mountain Lions on the Trail: They See You Before You See Them. I like to tell stories. Sometimes, I even like to write stories about things that I've seen, done and experienced. This one's a long one, so don't complain about "TL; DR" to me - you've been warned, but it is one of my favorites. I'm also happy to say that in my opinion, the story is made at least ten times better by the great photos that Calipidder lent me to accompany the piece, so go check out her site as well for more great trail reports and photos! So, without further ado, here's the story about how I avoided death-by-mountain-lion! In 1998, I was offered a job from the Backcountry Division of the National Park Service in Yosemite. The job was longer than a summer, since it started in April and ended in September, but the term of my contract said summer – one of the longest and best summers of my life. I went into my job a fresh faced 20-something year old, and came out a tan, still mostly fresh faced 20-year old with a unique perspective on wilderness, the National Parks, and life who was ten pounds lighter and needed a haircut badly. There is no doubt in my mind that that job was the experience of a lifetime. In case you’re not familiar with the National Park Service, it has a number of divisions and departments. My division, the Backcountry Division had three primary responsibilities: patrol and maintain the trails; issue wilderness permits; and preserve, protect and educate the general public about the park. These three responsibilities sound simple enough, but in reality, the job encompassed everything from telling park visitors where the bathroom was, to providing first aid on searches and rescues. Although it was the job of a lifetime, it was not for the faint hearted. Even though my contract said that I would work 8 to 5, or ten hour shifts, it was an all day job from the moment I went to bed and took off the uniform, and from the moment I woke up and put the uniform back on. Yosemite is a large park – as big as Rhode Island, and in Yosemite, there are a number of Backcountry Rangers with different areas of responsibility. I was a Valley Backcountry Ranger, meaning that I was responsible for the middle corridor of the park, heading down towards Wawona, and up towards Tuolumne, and bordered on the East by Big Oak Flat. Some people would say that as a Valley Ranger, I had the worst assignment, as I would see the most people. Actually, I had the best assignment as I ended up seeing most of Yosemite; but when I was starting out in April, I didn’t know much about the park. I had been to the park several times, but compared to visitors who had been traveling to Yosemite for over twenty years, or Rangers who had been living there for thirty years, I knew nothing. The first couple weeks turned out to be the best weeks of my job: as I was new, and as it was April, I spent nearly all of my time patrolling the trail, in order, as my boss put it “to get the lay of the land”. In those early weeks, I definitely got the lay of the land, covering mile upon mile on every conceivable trail. It was great – I was getting paid to hike. Even on my off days, I was encouraged to go to new destinations from other Rangers that I lived with. Despite all of the hiking, I still had a two page list of unknown spots in the park that people told me I “had” to visit. One of the spots on that list was the “Old Rockslides Trail”. If you haven’t heard of this trail in Yosemite, it’s because it isn’t really a trail. The thing about the Old Rockslides Trail that I’m trying to remember as I tell this story if it was an actual trail back in 1998. I think it was a trail that was semi-maintained by the National Park Service, but then again, perhaps it wasn’t even back then either. In any case, what the Old Rockslides Trail really is is the Old Big Oak Flat Road that used to run out of Yosemite Valley before rockslides (I know, surprising with a name like “Old Rockslides”) caused the road to be closed. If you’re at Inspiration Point even today, you can look across the Valley, and see what looks like a straight line road cutting across part of a talus covered road. You guessed it: that is the remains of the Old Big Oak Flat Road/Old Rockslides Trail. If you’re interested in hiking this trail, be prepared: while it may be a “trail” in the sense that it is easy to follow in places as it is an old road; in other places, it is overgrown, blocked by boulders, and not traveled by many visitors. (For more information on how to get here, check here and here). I was told that I had to check out the Old Rockslides Trail by my co-workers for one reason and one reason only: to see amazing views of the North Rim without being surrounded by tons of visitors. I was also told that one of the great forgotten viewpoints of the park was Rainbow View, which had been abandoned, but was accessible after heading up a steep boulder field. (This is the hike discussed in the link above). So, one Wednesday (Park Rangers never get Fridays, Saturdays, or Sundays off), I headed out from the Ranger Club (Yes, that’s where I lived, the Ranger Club – swanky!) and across the valley. It was a great spring day, and the temperatures were finally beginning to melt the snow up at the higher elevations. All around me, waterfalls – seasonal and regular – were roaring with the ferocity that only an El Nino year of melting snow can bring. After a bit of route-finding past El Capitan, I found the trail and continued up, heading out of the valley. It was a quiet day, and I could hear the snap of every twig and the crunch of brush as my boots passed through overgrown areas and various deadfalls. Alongside the trail, chipmunks raced along, chirping at me for a free handout. The wind rustled the leaves of the plants alongside me, and I could hear every leaf stretching and growing in the spring sun. As I ascended, I knew exactly why this “trail” had been recommended: there was indeed nothing like it on the “approved” list of National Park valley trails. It was wild. It was what the park had been; and what the park could be if man vanished. It was a great hike. It was also a hard hike. After I broke treeline, the road – what was left of it – vanished. In its place? Rocks. Lots and lots of rocks. And when I say rocks, I mean boulders. As I hefted myself over boulders, I checked my holds; checked my landings and most of all, watched for snakes. 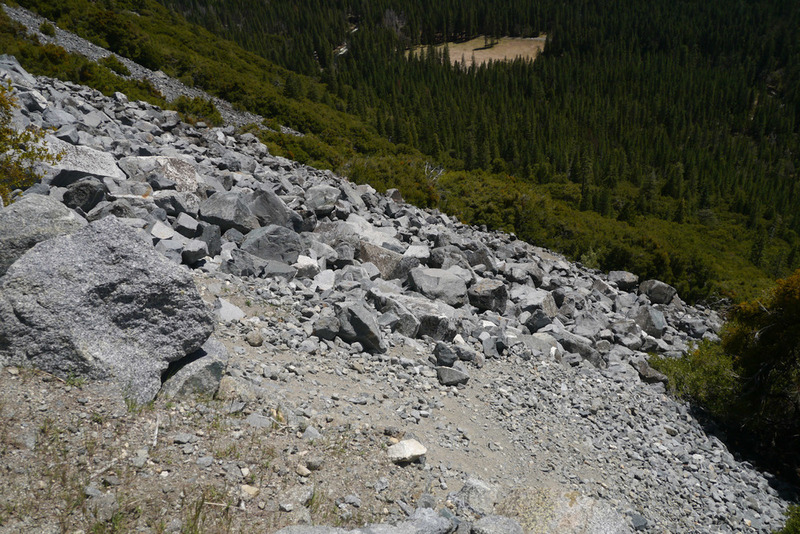 I even had to constantly check upslope for the stability of the field – it was after all, the old rockslides trail. At around 2pm, I began to consider turning around. I had probably gone about seven miles total from the Ranger Club, which meant that I would have had a fourteen mile day when I returned back home – on my “day off”. While the view was spectacular, I knew it wasn’t going to get any better within the next mile or so. I stopped on a particularly large rock, ate some lunch, and began to descend back the way I had come. The trouble about abandoned places, in my opinion, is that the mind begins to play tricks on you. The mind has evolved over thousands of years to survive; and it doesn’t like to be alone in the wild. The mind hears things where nothing makes a sound; it sees things where nothing is; and these two things are just the top of the iceberg. As I had traversed the boulderfield on my way up, I had begun to feel like I was being watched; and after several breaks to ostensibly look at the view, I had satisfied myself that those feelings were nothing more than the usual “heebie-jeebies” that new and empty places sometimes bring. But as I descended, the feeling began again, except this time, it was more intense. After a certain point, I was rattled. I had one eye on my immediate surroundings, so I wouldn’t break an ankle, and one eye on everything else. It was a sort of hop-drop-scan-hop-drop-scan routine that probably made me look ridiculously paranoid, and made me glad that there were indeed no people anywhere around me. Finally, after a while, I found myself at the edge of the boulderfield, and near actual cracked pavement leading back into the trees. I dropped down at the base of one last boulder and looked up as a matter of recent habit, and froze. Upon the top of that boulder, not more than six feet from me was a full grown mountain lion. My first thought was that my brain was playing a hell of a trick on me. There was absolutely no way that I could be that close to a mountain lion. After all, it was six feet away! I blinked. In fact, I didn’t blink. I shut my eyes for at least five seconds. I opened them. It was still there. At that point, my brain was positively screaming at me to MOVE! MOVE RIGHT NOW! But I couldn’t move. I was frozen solid. And then it looked at me. Its head turned silently on those creepy smooth cat vertebrae and it was looking right at me. Before its head turned, my brain had registered how I couldn’t see it. Its lower coat was gray – gray that blended right in with the rocks and its upper coat wasn’t exactly brilliant gold. These were the things my brain was chattering at me as I stared into golden eyes that looked like certain death. Because while its coat wasn’t snap-pow brilliant, it was clearly a healthy mountain lion. It was big – at least six feet. It didn’t appear to have an inch of fat on it; but neither was it skinny: all I could see was powerful cat muscles as it laid on the rock. And while I was dead certain its eyes were the last things I would see, they were stunning. I wasn’t sure how long I had been standing there, staring at it, watching it stare at me, but I knew my mind was still screaming at me to move, before it started screaming at me to go for the knife I had in my front right pant pocket. It was a three inch Buck folding knife. The fingers on my right hand may have flicked imperceptibly toward it as I continued to stare at the lion before a thought raced through my brain even faster than the one that had preceded it. That thought? Going for the knife isn’t going to do anything for you. You’d never get it out of your pocket at this distance. It wasn’t that I was resigned to die at that moment; it was just the certainty that there wasn’t anything that I could do to stop the process. Run? I wouldn’t make it a foot. Go for the knife? I was six feet away. The cat would leap on top of me, pinning me down with its momentum, claws, and teeth at a large twitch. So I stared. I stared. It stared. Time, to me, stopped. And then it closed its eyes, put its head down and stopped looking at me. I stared. Clearly, I was hallucinating. It didn’t move. It didn’t raise its head. Then, the voice in my head came back. GO. GO NOW. It said. As quick slow as I dared, I began to ease away from it, while facing it. Its head stayed down. By the time I’d reached the treeline, it was just a blob on a rock. A furry blob of death that I hadn’t seen and I had stumbled at least five times. Two switchbacks down the trail from treeline, when I couldn’t see the rocks, nor the blob anymore, I threw caution to the wind and broke into a flat out panicked full out sprint, risking ankles, knees, legs, and pretty much any body part to a major fall. I didn’t care. It wasn’t until I was on the valley road again did I allow myself the luxury of walking. And that was how I saw a mountain lion, got to participate in a mountain lion research study, and how I escaped death from a mountain lion as well. So yes, mountain lions: they're out there, and they see you before you see them.